Wish I had more photos but my camera battery died. A long but easy walking day today. The wind was up again massively today and day for an interesting decent from the top of the range to Lake Hawea below. The trail picked the escarpment from yesterday and continued to follow this down. Approaching onto a rocky spine the path became narrower with a few rocky scrambles around and down. Then it was a long switch backed track, crossing from side to side of a steep gully at least 20 times. The vertical distance wasn’t much but walking the switch back had to be near a kilometrs. I certainly wasn’t complaining. There need to be more switch backs on a lot of trail sections. 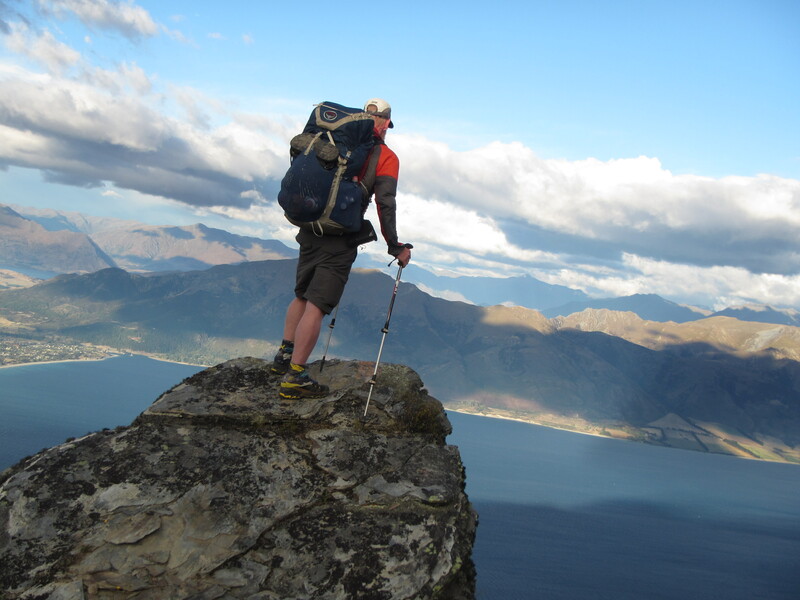 It was easy down and easier still on the Gladstone track to the Lake Hawea township. The wind was still crazy. I reckon 30 knots easily. Looking at the lake you could forgive yourself if you thought you were at the beach, the wind strong enough to kick up several sets of waves with a shore break. I must need to bulk up and put some weight back on as it really buffeted me around, pushing my sideways and trying to steal my hat again. Leaving Lake Hawea I picked up the trail along the Hawea River, following a gravelled path. It was flat and fast walking but dragged on a bit. I was keen to get to Albert Town for a feed as my food bag was the emptiest it has been to date, down to single museli bar and some powdered milk. Well fed the gravelled path continued right through to Wanaka, following the Clutha River and around the shore of Lake Wanaka. A long walking day with easy kilometres but I was stoked to reach Wanaka. I haven’t been here for about 10 years when I climbed Mt Aspiring. First priority was coffee then off to the post office to collect a package that my work mates had sent me. Nice one! Thanks guys. Loaded up with some of my favourite chocolates, vegemite, natural confectionary snakes and reminders of the worlds best coffee I’m missing from Fab back home. Also an article on Te Araroa from a magazine. Thanks Jo-Anne, Willow, Ash and others. Very much appreciated and a nice way to lift the spirits. It will certainly help get me through the last 400 kilometres. Not long to go now. Wanaka is crazy with tourists everywhere. Lucky I booked accomodation ahead. I’ve done the same with Queenstown. It’s always good to get into town an load up with nice food. I really enjoyed a large chocolate thickshake fin the afternoon and a large serving of shanks and porter beer for dinner. What a great pick me up from your mates in Aus. Not surprised that the wind picked up so much. Here in Aus they were expecting the highest tide ever in Qld as the continued repercussions of the Fiji disaster. Keep going, nearly there. Like you say, just keep putting one step forward. You have a great story to tell. Great pic, time lapse. Will be wonderful to see you in person very soon. Good pick up. I’d better change that.